Wet walruses waving wildly at Wendy the wallaby in Wallaroo. A wad is a lump or ball of something. 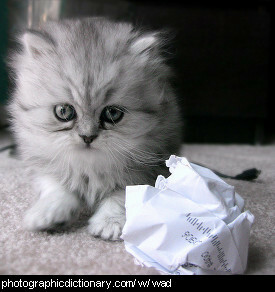 The kitten in the picture is playing with a wad of paper. Wading is walking through water. Usually you wade through shallow water that is less than waist deep. Any deeper and it would be easier to swim. 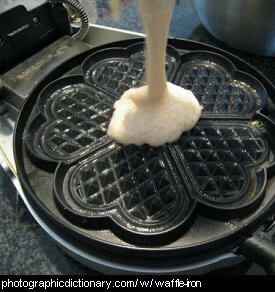 A waffle iron is a special device that makes waffles. 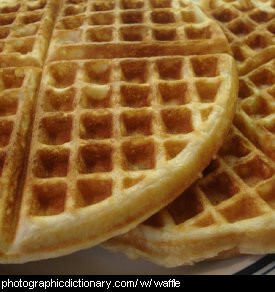 It has two hot surfaces that cook the top and bottom of the waffle at the same time, and a pattern in the waffle iron surface that makes waffles look so distinctively like waffles. 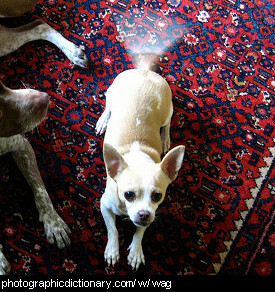 You wag or waggle something when you wave it backwards and forwards fairly fast. dogs wag their tails when they are happy. People sometimes wag their fingers to tell someone else off. 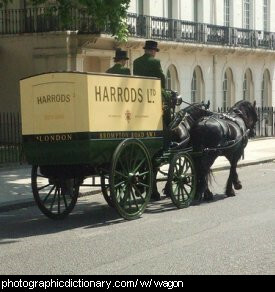 A wagon is a heavy vehicle with 4 wheels that used to be pulled by a team of horses or oxen to move large loads around. Today, wagons are usually used on farms and pulled by tractors. In some countries the separate parts of a train that are used to carry goods are called wagons. Your waist is the middle part of your body. Your belly button is on your waist. Belts go around your waist, and skirts and jeans fasten around your waist. 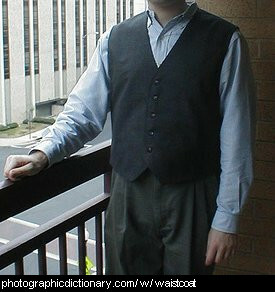 A waistcoat is a kind of jacket with no sleeves. Waistcoats can be made from ordinary fabric and buttoned up like in the picture, or knitted. Waiting is passing time until something happens. You often have to wait at a doctor's surgery, and sometimes you need to wait in a queue for something. People usually sit and read or just do nothing at all when they are waiting. 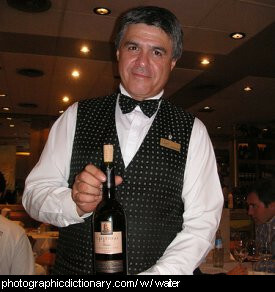 A waiter is a male person who waits on tables in a restaurant, serving customer's food and drinks and clearing tables when they are finished.